The famous photographer Eadweard Muybridge, precursor of cinema, on display in Milan at the gallery of Credito Valtellinese Group Foundation, that from almost twenty years has an active role in promotion and divulgation of culture. Finally Milan pays tribute to Eadweard Muybridge (1830 – 1904) with the exhibition Muybridge Recall, curated by Leo Guerra and Cristina Quadrio Curzio at Credito Valtellinese Group Gallery. Open until 1st October 2016, the exhibition shows artworks that represent the conjunction ring between photography and cinema, such as the well-known sequence of the horse gallop and the delicate researches on human figure, that has revolutionized the perception of the movement in fine arts. “Muybridge’s photographs clearly reveal the mistakes of the sculptors and painters when they have represented the different strides of a horse”, said the writer Paul Valéry observing all the paws stay simultaneously up from the ground for some fractions of seconds. Muybridge Recall is one of the several projects undertaken by the bank group on art and culture, in a story of sensitivity and dedication, happy intuitions and attention for the territory. The director Tiziana Colombera retraces the steps of this charming tale, with characters such as Andy Warhol, Daniel Spoerri. Alessandra Ghinato: How was the foundation born and what’s the story? Tiziana Colombera: «Constitued in 1998 as regional foundation by Credito Valtellinese in occasion of its 90°, in 2001 became Credito Valtellinese Group Foundation with national efficiency. The Foundation has the task – as declaimed by the Statute – of “pursuing the aim of promotion and support of initiatives for cultural moral, scientific, social and socio-economical progress especially in the territories e for the community where the bank institutes of Credito Valtellinese Group works”. It plays with full autonomy , a significant role in the fields of social , cultural and beneficial interventions, but remains nevertheless a close relation with group banks ( Credito Valtellinese , Credito Siciliano , Carifano ) , as these equip each year the Foundation of resources for carrying out the activity . The Foundation operates in three sectors : social solidarity , guidance and training , art and culture . The latter activity , awarded the ” Guggenheim Award – Corporate culture 2000 ‘ , which extends mainly to two strands , the exhibition at the Group’s artistic galleries in Milan , Sondrio , Acireale and Fano or art consulting arrangements, Italy and abroad , and editorial staff. Selected by the merchant Alexandre Iolas, artists of the early years were, among others, Andy Warhol, George Baselitz, Joseph Beuys. Who are the artists of the present and who is now the “guide ” that gives direction to the banking group acquisitions? As a number of popular cooperative banks at a local character does, in the first decades of life , Credito Valtellinese – founded in Sondrio July 12, 1908 under the name of Banca Piccolo Credito Valtellinese – tentatively inaugurated their collecting activities with discontinuous purchases of paintings signed by local authors. 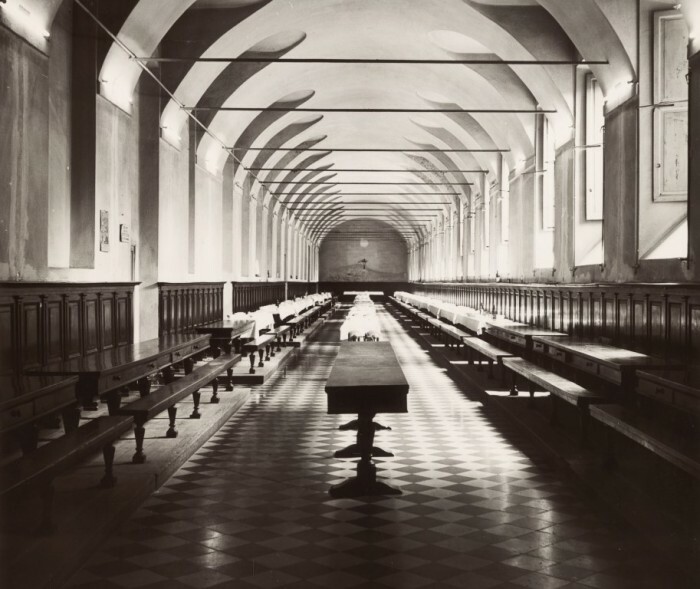 This approach would have lasted until the second half of the sixties , when the Bank was offered the opportunity to acquire a number of paintings of an important noble Venetian family . A real breakthrough – also determined by the increase in financial resources and available space – happened to coincide with the purchase , in 1982 , the Palazzo Sertoli in Sondrio and with the opening of the first gallery in the Palazzo delle Stelline in Milan in 1987 , followed by that from Sondrio . A.G.: From How many works is made up the collection and how are they categorized ? Is there a digital archive? Tiziana Colombera: «The collection consists in about 4,000 pieces and works are digitally cataloged». A.G.: Did the crisis erupted in recent years arrested the cultural investment ? What does it mean for you do patronage today? Tiziana Colombera: «The Credito Valtellinese Group has not arrested the cultural investment; it has reduced and modified in part the exhibition program , which is fully designed and managed by the Foundation with their Cultural and Artistic Sector jointly with the Design and Art Consulting Service and approved by the Management of Cultural and Artistic Activities Committee of the Group. The underlying philosophy of the artistic design of the four exhibition spaces is to propose , at times fairly pioneering , themes , artists , lines , hypotheses that are the fruit of a reflection and a new point of view, generated by the idea that it’s important to offer to the public new projects at the conceptual level , exhibition and critic . In addition to exhibitions producing, which are often provided and circuited in the Group galleries , are expected even educational projects involving the local educational institutions , in collaboration with the Sector Guidance and Training Foundation and with local cultural workers or membership initiatives Abi national (eg. Invitation to the Palace , the Creative Culture Festival). This is make patronage, for us». A.G.: Your business is strongly linked to the territories where you work, such as Milan or Valtellina . What’s the local impact of your projects ? Tiziana Colombera: «Our banks are closely linked to their territories of origin and presence. Credito Valtellinese Group Social Responsibility is an integral part of the governance and corporate strategy system. It helps to draw its own identity, determining a sort of “social positioning” that accompanies at the traditional economic positioning. It’s considered more and more as a business investment, a source of opportunity and competitive advantage and differentiation; takes on the guise of true and proper “responsibility for the development”. In this way all the Group’s local banks are proposed on the market as genuine stimulators and catalyst of the local growth factors. Also in the cultural field the guiding principles are those linked to the statutory requirements to contribute to the cultural, moral, scientific, social as well as socio-economic. The Foundation operates, in all its activities, in synergy and partnership with organizations, national and international institutions, to meet the specific and real needs of the territory in a complete and punctual manner». A.G.: Which are the activities and future projects of the Foundation? Tiziana Colombera: «The 2016 sees the Foundation committed to help young people, with the building up of a strong professional orientation and upgrading of the approach to the labor market , even after the entry into force of Law 107 of 07/13/2015 on Good school in particular, the news on the alternance between school and work to help the all students in high schools , technical and vocational institutes to carry out an educational experience in the working world complementary to the school one. Won’t miss the support to the third sector and , particularly , to the associations and organizations operating in favor of needy families , disabled people and , more generally , the most vulnerable categories . Also the exhibition and publishing activities will be the subject of attention, in consideration of the formative importance, teaching and dissemination and promotion of cultural heritage. Especially in this area, the activities are intended to bring the exhibition program, expected in the 2016/2018 plan, maintaining constant attention to the effective use of the allocated resources, the quality and originality of planned exhibitions in line with the tradition that marks the thirty-year activities in the sector, expanding where possible internal and external partnerships; with the objective of approaching to contemporary art of an increasingly large number of people through guided tours, workshops, and events dedicated to direct involvement projects of educational institutions. By continuing with the art consulting activities for national and international institutions also enhancing exhibition and publishing projects realised for the Group’s galleries, presenting them in other contexts». 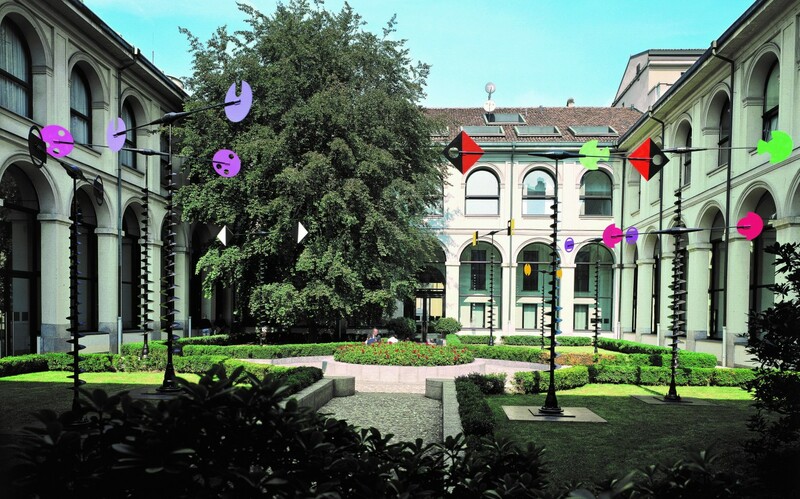 Cover Image: Takis’artwork outside Credito Valtellinese Gallery, Credits Credito Valtellinese Group Foundation.